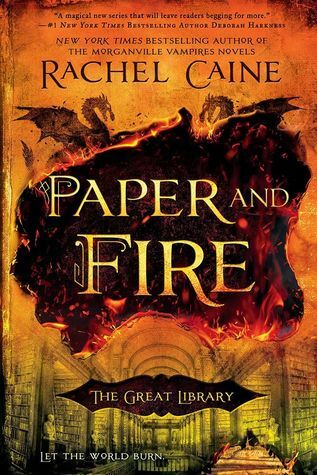 PAPER AND FIRE is the next novel in the The Great Library series, and we're delighted to have Rachel Caine stop by to chat about it. There's a scene toward the end of the book that's set in the Black Archives, and that was really the one where everything tied together for me ... the relentless ruthlessness of the Library, the realization of just how much the world had been changed by it, and the personal horror of the characters at discovering the truth. It was a painful scene, and also it felt really, critically important to understanding the world. Building alternate history can be very tricky, to create a consistent and believable world and yet not overdo it for the reader. For me, the Black Archives scene really accomplished everything I wanted it to do. How long did you work on PAPER AND FIRE? The actual writing of it was about three months, but creating this world took more than 10 years of tinkering ... I started writing scenes of it, and playing with characters, in about 2006 or 2007. I really loved the ideas I had, but it took quite a while to find the right structure, right point of view, and really understand the world I was trying to create. That was the hard part, I think. So, either three months or 10 years! Good question, because I think every book I write teaches me something, and this one made me think very hard about where and how to start it. I generally know where a story starts (and ends) but this one really ended up a puzzle. I had to be very, very patient with it and try different things until it--excuse the expression--caught fire. So I suppose its main lesson for me was patience and steady progress, which is a little what the characters are learning in the beginning, too. What do you hope readers will take away from PAPER AND FIRE? I hope they'll hug their books (electronic or paper) closer, and realize how easy it is for things they love to just ... disappear. Books are an expression of imagination, and experience and history tells us that they can vanish without a trace when extremism and suppression take over. I'm an anomaly, don't judge by me! I never wrote a full book until someone bought from a proposal and sample I did in 1991, and I have no "trunk novels" ... basically, every book I've written has been published, or I didn't write it. HOWEVER. I spent a good 15 years writing short stories and partials and refining my craft before I ever tried submitting anything for consideration ... and I didn't understand even then that I should have finished the first book before submitting. I've made a lot of mistakes, and that was a big one. It worked out, but this is a "don't do as I did" teaching moment! I don't think there ever was, really. There is in every book a moment where everything falls into place, and I understand that novel, but each key, each novel is entirely different. It's strange but true: I know how to write the book as a single project, with its own unique challenges. I don't think there's a single magic formula. Up until 6 weeks back, I would have told you my ritual was to write on my laptop wherever I was, and listen to music (I create playlists for each book). That I almost never wrote at a desk. Then I found out that working so hard on a laptop in bad conditions for many years had severely injured the discs in my neck and upper spine, and the first thing I had to do was get rid of my laptop and set up an entirely ergonomic workspace if I wanted to keep writing with a keyboard. I'm also supplementing with Dragon Naturally Speaking to do interviews and messages, and will be tackling my first ever dictated book next month. So rituals change! They have to. Patience. This is not an exciting game; it's a long one, and the moves you make take years to manifest in any real way. Don't set yourself a time limit, and don't beat yourself up for not being an overnight success. But, by the same token, refine yourself. Learn. Grow. Don't get resentful and cynical; it only hurts you in the end. Be open to opportunities and happy for your colleagues. And most of all: there is NO RIGHT WAY. There is only your way. I'm finishing up the third Great Library book, ASH AND QUILL, and starting on a new thriller called STILLHOUSE LAKE, which will be out in early 2017! Then I start on a fun new series with Ann Aguirre called THE HONORS, an outer space epic adventure. After that, a new Weather Warden novel, RED HOT RAIN! List. Her Great Library series launched in 2015 with Ink and Bone, an international bestseller and critical success and winner of multiple nominations and awards. Ink and Bone was named to the Lone Star List for 2016 by the Texas Library Association. Paper and Fire, the second in the series, releases July 2016. Have you had a chance to read PAPER AND FIRE yet? Are you writing in an ergonomic workspace to take care of your body? Are you growing and staying open to opportunities? Share your thoughts about the interview in the comments! INK AND BONE was a fantastic read. Excited for the sequel! Thank you, Ms. Caine, for your words of wisdom and a wonderful series to lose sleep over.